London St Pancras station – Meet your representative at the ticket office. Operating hours are 10am until 5pm. A full loop takes 50 minutes and buses run every 60 minutes. Arrive at London St Pancras station at 9am, where you will meet a Golden Tours representative who will be standing at the National Rail Ticket Office. Receive an informative welcome pack, holding all you’ll need for the day, ready to board your train in time to set off at 9.40am. Arrive to Brighton station at around 11.09am. 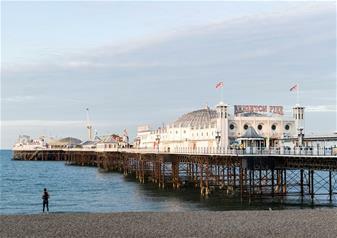 Once off the train, the sparkling city of Brighton is yours to explore. From the stunning pebble beach and the glittering coastline, to the colourful amusements and the independent shops and cafes, there’s no shortage of things to do. To get your bearings, this package includes a hop-on hop-off bus ride around the city. There is a bus stop right outside the station. See all the Brighton sights including the Royal Pavilion and the beautiful Regency architecture, travel easily around the city and learn all there is to know about this special seaside destination. Stops include Brighton Pier, King's Road, Grand Avenue, Palmeira Square, Lansdowne Road, St Anns Well Gardens & Furze Court, Brighton Station, Imperial Arcade, Marine Parade, Royal Crescent and Brighton Marina. Spend the rest of the day exploring Brighton in your own time, before you catch an off-peak train of your choice back to London St Pancras. Please Note: The train times are subject to change, depending on availability on the train services. So it is highly important that you leave your contact telephone number & email address in the checkout process so that we can contact you if needed.